The AirCharge compressor features stainless steel panels containing all necessary system components. An automatic drain and muffler/reservoir are standard. Excellent serviceability is assured with a side door panel and removable front door. 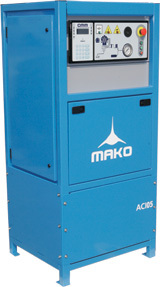 These three-stage air compressors also include a MAKO air purification filtering system. One side access door and removable front access panel with spring-loaded latches reduces vibration and clatter.